Cryotherapy facials is the new and improved way to do facials. The process involves applying a gentle stream of cool air over your face for a varying amount of time depending on each individual. The cool air activates the production of collagen and other natural components which rejuvinates your skin leaving it smoother and more youthful in appearance. The skin is stimulated to repair itself and regain elasticity. 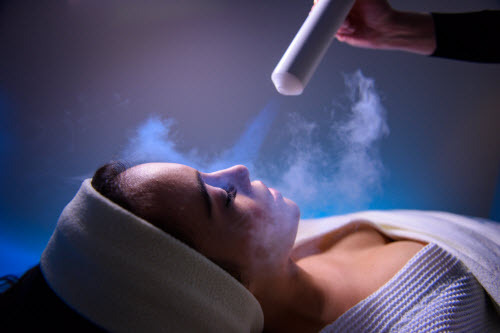 Cryotherapy facials reduces wrinkles, reduces blemishes, and makes your face more firm. In short, cryotherapy facials can minimize the signs of aging and make you look more youthful. When you come in for your appointment, come as you are. You do not need to remove make up or wear special clothing. We will provide you with the necessary items to make your visit a comfortable and relaxing one. Cryotherapy sessions can last up to 15 minutes but you can also combine it with one of our massage or spa services so that you can maximize the benefits of your session with us. Revive Body Mind offers whole-body and localized cryotherapy sessions geared towards repair and recovery. Whether you want to accelerate healing or diminish blemishes, we can find a program that will meet your health and beauty needs.